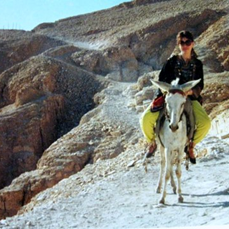 Jonna’s first few trips to Egypt were study trips to support her passion for Egypt’s ancient history. 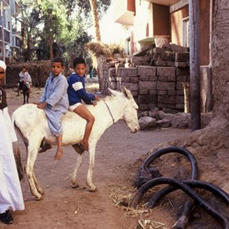 During each visit she spent more time living in the villages and getting to know the culture and customs of Upper Egypt. 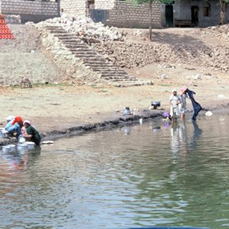 Over the ensuing 25 years she divided her time between her home in the USA and living along the Nile, forming close and lasting relationships with the villagers. Sometimes during the winter it was cool enough in the mornings that my girlfriend and I could take a little walk for exercise and pleasure. No matter what time of the year, the fields and gardens of Egypt are always bountifully beautiful and green, which seems so incongruous because before the field was growing crops, it was just a piece of dry desert. It gave me such pleasure and fulfillment to walk along the high banks of the canal, with lush crops on the upper side and water on the lower side of me. I loved watching the bird life and the small animals that made their home close to the water. One particular morning, as we strolled leisurely along, engaged in serious girl-talk, we heard especially loud grunting noises, with a lot of activity and rustling and thrashing about in the thick growing barsem (clover) crop to our right. Curious, we slowed our pace a little so that we could see what it was. We had never heard a sound like this. Charging at full speed out of the clover, coming directly at me with mouth wide open, was a five-foot crocodile. 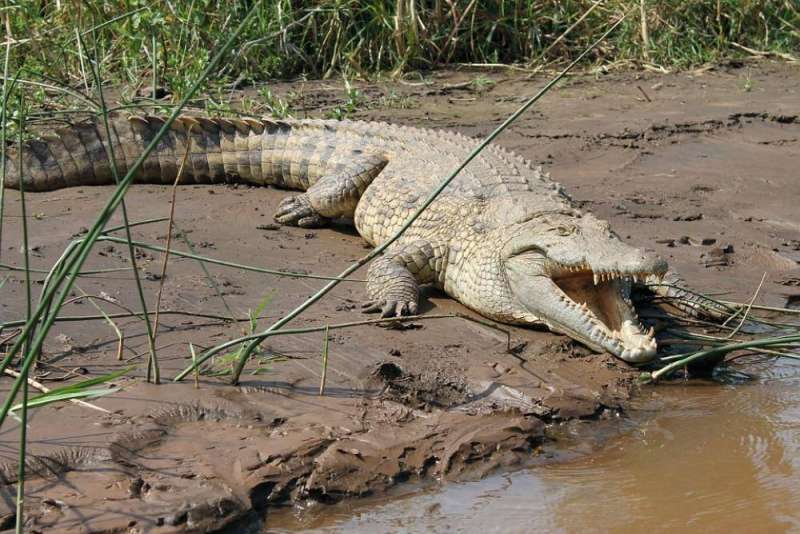 The Nile crocodile has earned a reputation for being the most vicious of all the crocs. This couldn’t be really happening! I froze in my tracks. No matter how hard I tried, my legs wouldn’t move. My feet were cemented to the ground. My friend was several steps ahead of me and I could hear nothing but her panic-filled screams. I knew my life was over and the crocodile would devour me on the spot. I couldn’t get my breath! I couldn’t call for help – there was no one around. I was acutely aware that I was going to die a horrible and extremely painful death. This would be the end of me. How long would it take for me to die? 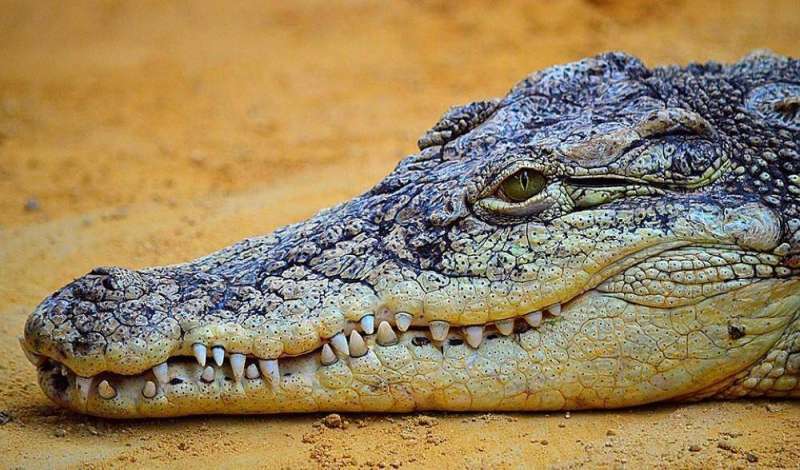 Would the croc start by ripping my limbs from my body or would it just chew me up, bite by bite? This was going to hurt. Please, dear God, make it quick. 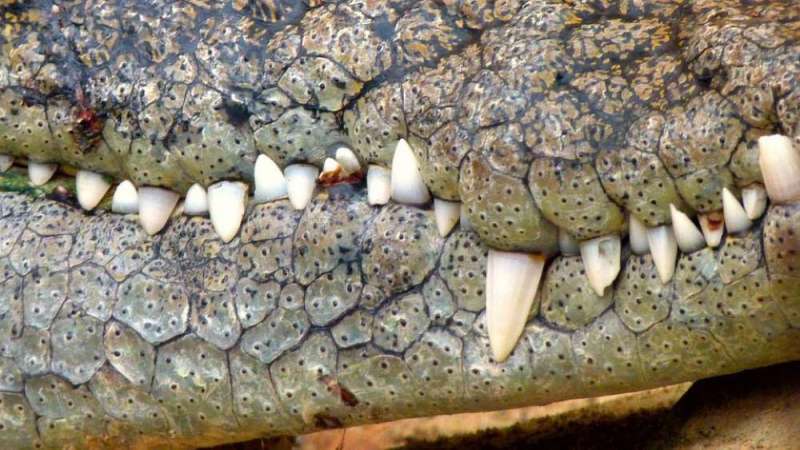 The reptile was so close it was possible to count its ugly teeth and see how sharp and dirty they were. The crocodile was in such a rush coming at me that she ran straight across my feet, causing me to lose my balance and fall to the ground. She kept going at full speed, down the steep bank, to the canal; not even giving me a second look. I had just taken about two seconds and mentally prepared myself for death. What happened, I wondered? This was very confusing. When I realized that I was still alive, I lay on the dusty path and sobbed and sobbed – big crocodile tears you might say – between gasping for my breath and shouting out “il hamdu lil Allah! il hamdu lil Allah!” You see, she was off to protect the babies she had left behind. I had gotten between her and her young ones. This is not an incident that one forgets or puts aside easily. For weeks and weeks I could not get images out of my mind and I kept thinking about the facts: I know there are no longer crocodiles north of the Aswan Dam, yet I did encounter this one. In Pharaonic times crocodiles were revered as gods and were plentiful along the River Nile, as were hippopotami. But they have all died out and the upstream dam prevents those in the south from traveling north. I kept thinking that the nose of this crocodile was a little more pointed than most crocs I’d been close to. But its mouth was wide open and it was trying to scare me. As I gave it more thought, it seemed like its tail was slightly different and maybe its legs were just a little longer than other crocodiles I’ve seen. But it was a big one and it was moving very fast. I asked almost everyone in the town of Luxor about this animal and received no helpful information. People kept telling me that, yes; there are still crocodiles along the Nile and in the canals. 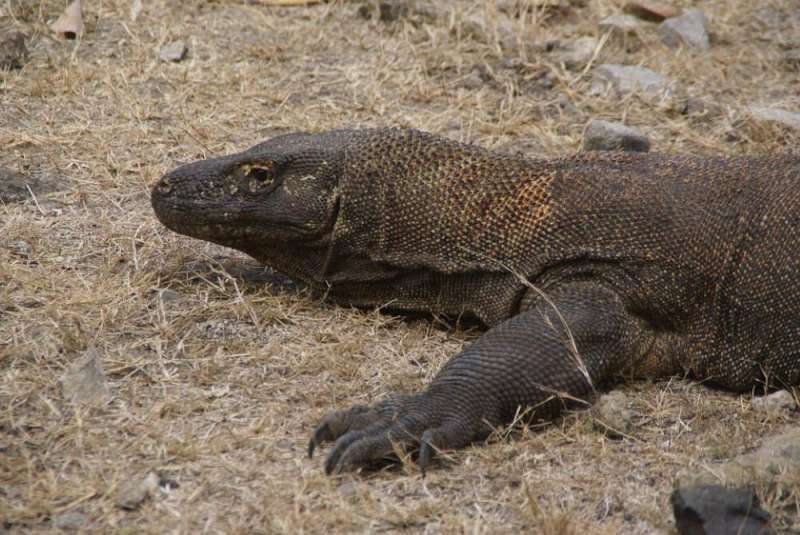 Finally, several months later, I came into the possession of a magazine that featured an article on the two types of monitor lizards that live in the Sahara here in Upper Egypt. 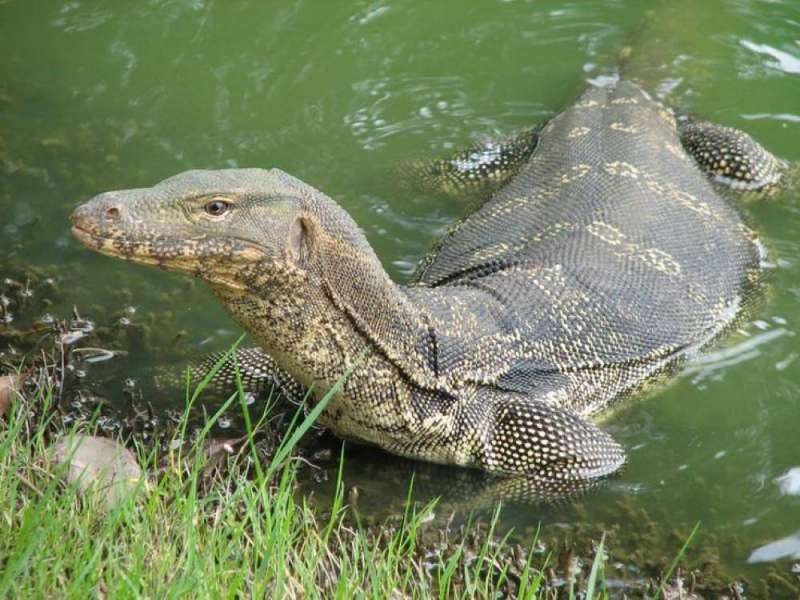 The desert monitor is very rare and the water monitor is even rarer. They do their best to avoid humans. The name is a warren. Il hamdu lil Allah! I learned that it was the rarest of monitors I had encountered and water monitors feed exclusively on fish and vegetation! Still, I never walked that pathway again. Jonna is one of the founders of the Egyptian Study Society (ESS) at the Denver Museum of Nature and Science, has served as a docent at three major Egyptian exhibits, is a founder and past editor of The Ostracon, official newsletter of the ESS, and when she isn’t lecturing at the schools or civic organizations, she organizes and leads trips to Egypt. She’s happy to answer your questions. Jonna’s E-mail. 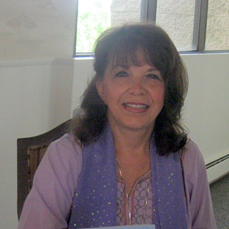 Her book Way Down in Upper Egypt: A Western Woman’s Life Along the Nile; in Depth and Intimate is a collection of colorful and intimate stories about the people, culture and customs in this region of Egypt, where life continues much as it has for the past hundred or so years. Why is this unique area called Upper Egypt when it’s down in the southernmost part of the country? Why is marriage to a first cousin the most desirable and sought after, why don’t automobile drivers turn on the lights after dark and what it means when a man puts his “tails in his teeth”… Paperback and hardcover available at Amazon. Here are a few photos of her memories! P.S. Note from Tom and Sheila: We were asked to speak about our travels at a Sertoma Club. Afterwards, one of the gentlemen (Bob) asked us to speak for his Optimist Club and mentioned his friend, Jonna. He was certain we would enjoy meeting her, so the four of us had dinner together. It was a beautiful meal prepared by Jonna in her home here in Denver and we all talked non-stop for hours about our various adventures. Jonna is a delightful storyteller and gracious hostess. We’re grateful to Bob for this new friendship with them! Hello Helen! Wow, sounds like we’ll have to watch our step when we go. I have a feeling you and Jonna would have many fun stories of adventures and local experiences to share. Enjoy your return trip this summer! We’d love to see your photos, if you have a chance to share them. Wow, what a story. I too am an Optimist. I do not get to meetings near as often as I should, but I am sure they will be thrilled and excited to hear some of your stories.